Other possibility – a quick googlysearch showed some surveyor’s tool kits were cylindrical/semi-ovoid, and included folding rules, compasses, protractors, etc. Perhaps the wee ones were taking geometry lessons in between the casting of the lines? perhaps a second folding fishing pole? The one the boy is holding has segments about the same length as the cylindrical case. I thought something similar it just seemed that the case was a bit short especially for the handle segment. Maybe it is a smaller pole. The contents seem to be the same color as the pole. If I was pressed I think that is where I would go. And of course, the recumbent reader is reciting from Izaak Walton? though it’s a strange place for one. Excellent post. I agree, it appears to be a cylinrical container with sections of dowl or rod. I must edit the image for a closer look. If we’re looking at what I think we are – the small dark cylindrical container – it is FAR too small to hold a fishing pole in segments. An 8-10 foot would pole made up of 6 inch segments impossibly stiff. Worthless as a fishing pole. If it has anything to do with fishing, it probably held leaders, line dressing or the like. I do believe the small cylinder could be holding wooden floats for fishing. Both fishing rods have wooden floats attached to the lines but they seem to be well shaped/whittled and painted where as the pieces of wood in the cylinder are not. 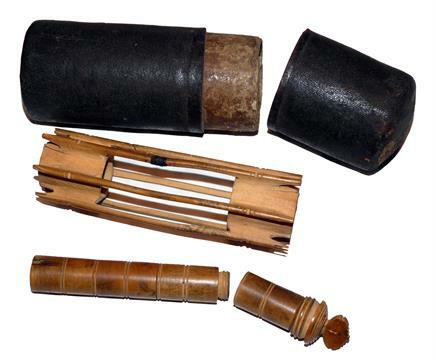 The fishing rods appear to be bamboo rods and as such not segmented portable rods. Who cares what that little device is, I can’t take my eyes off the lady’s beautiful quilted petticoat and the frothy “best dress” sheer apron she has on over it – just for show not protection because she wasn’t about to cook a meal! Just a possibility on the small tube. 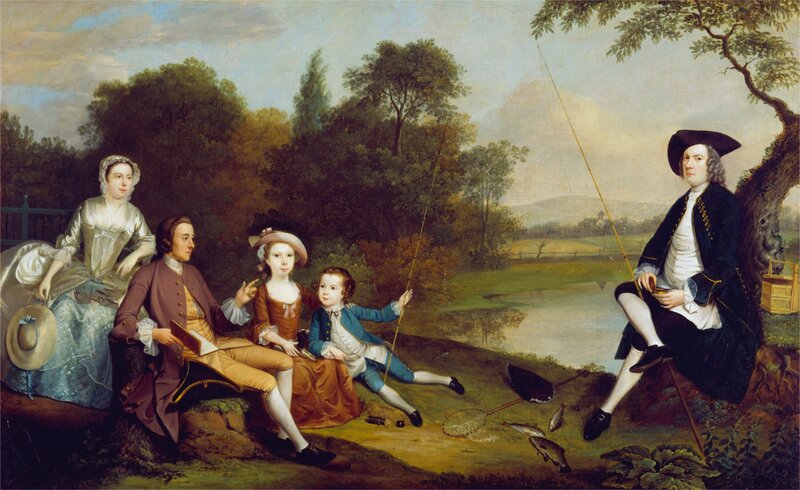 I have done a bit of research into fishing tackle of the period and the only thing missing in the painting is the Line Winders used to hold the line and float and hook. They are usually two 4-6 inch long sticks with a peg between them at both ends that the line is wrapped around and eventually the bobber and finally the hook end. The lines, bobbers, and hook were pre tied and stored on Line Winders. They were not left attached to the bamboo poles. Looking closely at the tube it does appear that there are groups of sticks with a gap between them in the tube. My only concern with this possibility is that Line Winders usually cam in groups of 4 to 6 pegged together and in a box and not individually in a tube but that does not mean this isn’t the case. I added “fishing treen” to the tags – great catch!